The magnific ent terraced rice fields, also called ladders to the heaven, with ripening paddy grains of ethnic minority people in Yen Bai province’s Mu Cang Chai district or Ha Giang province’s Hoang Su Phi district have attracted a large number of tourists, tour operators said. As one of the most popular destinations of the northwest, Mu Cang Chai terraced fields, which have been cultivated by the H’mong people for hundreds of years, have long been known by local adventurers and foreign travelers because of the fields’ spectacular beauty. Terraced fields in Mu Cang Chai are beautiful all the year round. Visitors in March are treated to the sight of glittering ponds. Locals transplant rice seedlings from April to May. After that, all hills are covered by an everlasting green. The fields start to turn yellow with ripe rice from early September. The fields are visible from virtually everywhere in the district as they expand over 2,200ha, including around 500ha in Che Cu Nha, La Pan Tan and De Xu Phinh communes. Those in these villages were recognised as a national heritage in 2007 by the Ministry of Culture, Sports and Tourism. Journeying to Mu Cang Chai, tourists will be dazzled when they witness the breathtaking scene of immense terraced fields. Apart from the fields, they can watch daily activities of ethnic minority people in the mountainous region. Women usually sit on pathways to sew and look after their cows grazing nearby. Mu Cang Chai, which is itself a quiet district on the bank of the Nam River, is blessed with beautiful flora and fauna and outstanding geographic features, including vast mountain ranges with high peaks which have protected the people for ages. Tran The Dung, deputy director of Young Generation Travel Co., was quoted by Vietnam Net newspaper as saying that the firm has taken many groups of tourists from Ho Chi Minh City to Hoang Su Phi, Mu Cang Chai and Ban Gioc Waterfall (Cao Bang province) in the past 20 days. At Fiditour Co., the number of tourists buying the five-day tour to Viet Phu Thanh Chuong, Muong Lo, Mu Cang Chai, Sapa and Muong Hoa has also increased by around 25 percent year-on-year. 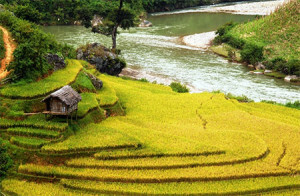 According to Pham Viet Phuong, head of the travel office at Yen Bai province’s Department of Culture, Sports and Tourism, the number of tourists visiting terraced rice fields at this time of the year is higher than last year. “Hotels have more tourists, local people sell more souvenirs,” he told Vietnam Net. Yen Bai has yet to have official statistics on the number of tourists, but there were around 3,000 tourists flocking to Mu Cang Chai in late last month to admire terraced rice fields and join activities of the Culture, Sport and Tourism Week of Mu Cang Chai Terraced Field held in Mu Cang Chai district from September 26-29 to mark 55 years since President Ho Chi Minh visited the province.